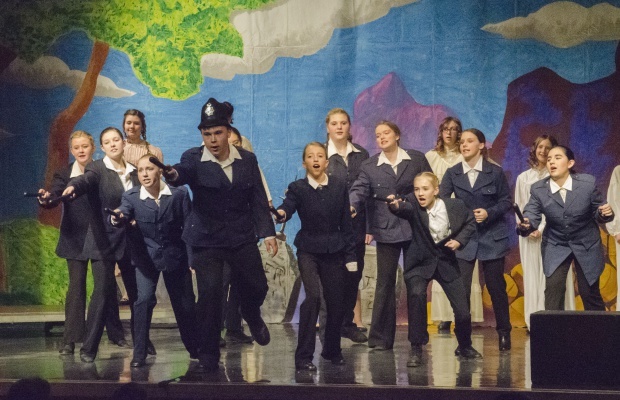 In March, 600 Dixon students, families, and former students flocked to our theater to watch our production of “Pirates of Penzance”, a comedic opera featuring a band of tender-hearted pirates, a gaggle of daughters, and a squad of cowardly policemen. 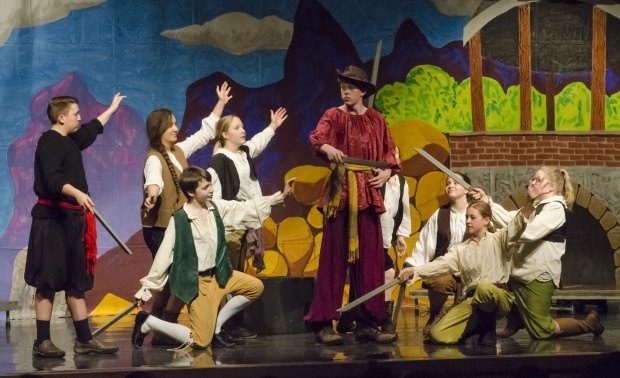 Mason Robinson (center) as the Pirate King, surrounded by his motley pirate crew. Set in approximately 1879, the story begins with a man named Frederic (Jacob Benson) who has just completed a 21-year apprenticeship to a pirate crew, lead by the Pirate King (Mason Robinson). Done with the pirating life, he sets off into the world for the first time. Though romantically pursued by the pirate’s maid, Ruth (Ali Cook), Frederic determines she is too old for him before meeting and instantly falls in love with the young Mabel (Kristy Barnhart-Armstrong). She is one of the Major General Stanley’s (Milo Hults) many daughters, and trouble abounds when the pirates decide to kidnap the daughters to marry them. 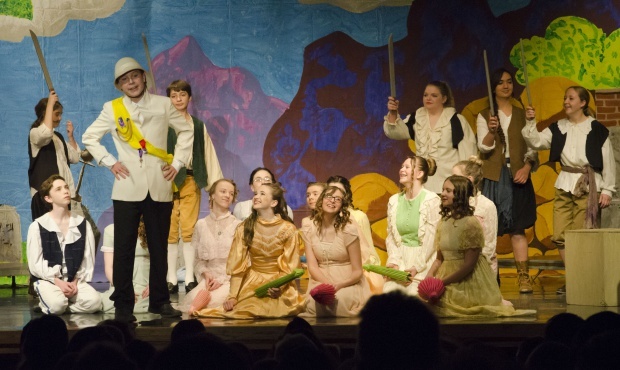 The Major General (Milo Hults) with his many daughters and some pirates. 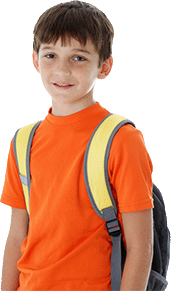 More trouble befalls our hero when it’s revealed that since he was born on a Leap Year, he has not technically completed his 21-year responsibility to the pirates. It was entertaining happenstance that this musical was chosen for production during a year that included a Leap Year! Ruth, played by Ali Cook, about to reveal to Frederic (far right) that he was born on a Leap Year. The pirates face off against the police force, lead by the Police Sergeant (Ben Hults) in an exciting finale before a peaceful resolution is made. The Sergeant (Ben Hults) with his police force. Rehearsals for the musical “Pirates of Penzance” began in November, five months before the performances at the end of March. 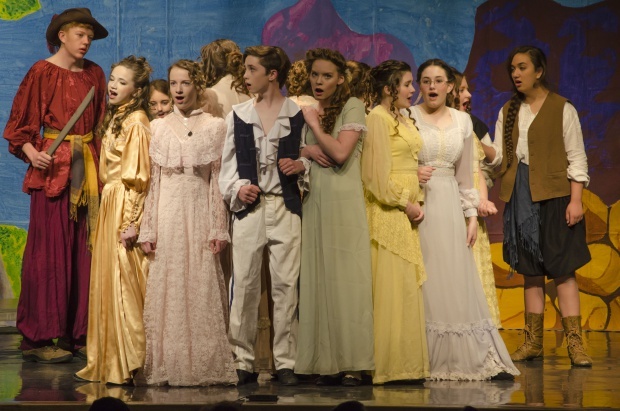 If they weren’t familiar with the musical beforehand, cast members quickly realized just how much of a challenge this classic play really is. Though Dixon produces the abridged version which only runs an hour long, the musical was still packed with songs that involved major choreography and vocal challenges. Such songs include “Major Modern General”, which is a fast-paced tongue twister, and “Poor Wandering One”, an acrobatically musical song with a wide soprano range. 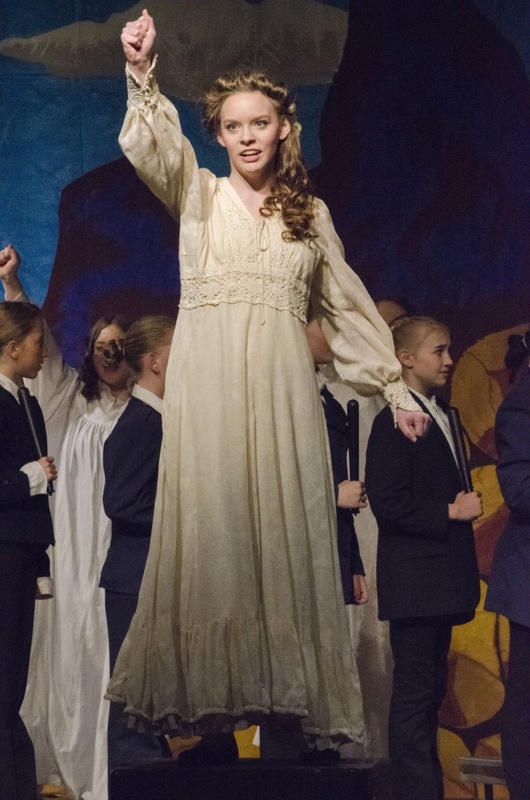 Kristy Barnhart-Armstrong as Mabel, rallying the police forces. Ultimately, our students rose to the challenge and put on three excellent and entertaining performances on March 25, 26th, and 28th. Nicole Marriott, Dixon’s drama and ballroom teacher, was the show’s director. Jeremiah Tijerina, who teaches choir, directed the cast musically. 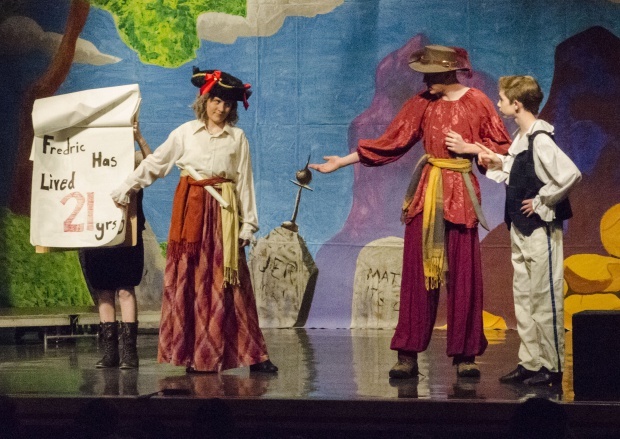 Chelsea Cellar and Jeremy Harris, Dixon’s art teachers, assisted with costuming and set pieces respectively. If you would like high-resolution photos, please email chelseac@provo.edu.